The landmark of a city tells a lot about its culture and lifestyle. With the moving tide of time, landmarks also undergo transformation. 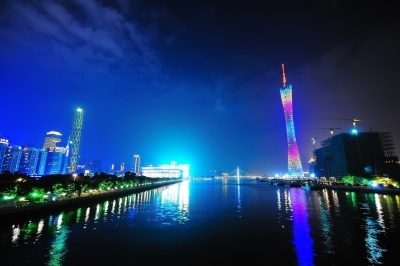 The Canton Tower, alternatively known as Guangzhou TV and Sightseeing Tower, is one of the most prominent landmarks of the city. Apart from representing the modernized life of the city, this 610 meters tall structure is the tallest tower in the world. Of this total height, the antenna itself is 156 meters tall. The tower is strategically placed in the business area of Guangzhou, China. Towering over the other buildings in the vicinity, the TV tower is also known by its local nickname - Xiao Man's waist. The allusion here refers to a famous Geisha who used to entertain people during the reign of the tang Dynasty. She was appreciated for her slim waist. Justifying the comparison, the tower has a twisted and tight appearance in the middle part. Located in the southern part of the Pearl River, the tower was created based on an award winning design prepared by Mark Hemel and his wife Barbara Kuit. The husband-wife duo worked for Information Based Architecture, a company in Amsterdam. The structure is divided into 5 zones, which are A, B, C, D, and E.
Zone A houses the Food Street, Integrated Services Hall, Multi-functional Exhibition Hall, Retail Stores, and Conference Rooms. Zone B, on the other hand, has a 4D cinema hall. If you go to Zone C, you will find the observation and adventure area. The most popular attraction of this area is the spider walk. If you have had enough of roaming, and you are already feeling tired, you can go to Zone D to relax in the cocktail lounge. It is in this zone that you will find the broadcasting chamber of the TV. Reach Zone E and you would have reached the right place to take a glimpse of the city of Guangzhou. It is in this zone that you will find the two observation decks. It is the top level just below the antenna, and is about 450 meters from the ground. Apart from the observation points, you will also find a VIP Chinese Restaurant and a French and Mediterranean Buffet Revolving Restaurant. Zone E also has a post office, which has the distinction of being the highest post office in the world. You can enjoy various rides in the Entertainment Adventure facilities section. The rides here include Hair Raiser and Bubble Cars. An outdoor observation deck and two science education halls are present in this zone. In addition to all its facilities, the tower is famous as an environment friendly and energy saving construction. There is something extra for adventure lovers as well. You can climb to the top, and enjoy a ride on the Ferris Wheel. It is actually the roof of the tower. You can jump into any one of the 16 transparent cars and enjoy a half-an hour ride. The Gravity Machine is another attraction of the place. It will drop you from the highest mast so that you can have an experience of the gravitational pull. Sounds interesting? Well, it's worth a try. So, visit the tower to have a great time, and enjoy the experience of watching the city of Guangzhou from an entirely different perspective.